Product review: brilliant! inspiring for me – by Karsten, 28 Aug 15 5/5 Excellent "My wife sorted date. Easy access (from Esher, Surrey)lots of parking available. The facilities were ok, tea was offered. Impressed by the amount of helicopters based on Redhill airfield, (briefing was) in front of and in helicopter accurate, relaxed, operator left space for questions. Had a brilliant time! It was inspiring for me, thinking of becoming a helicopter pilot! Got the bug!! . 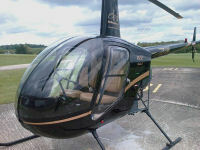 had a busy day so my fault not to stay for another cup of tea... "
The R22 is the ideal training helicopter. One Flight of 20-25 minutes during which you take the controls, lesson time 40-60 minutes. Maximum weight 17St (108Kg), please advise us if over 15St (95Kg).